Almost 24 hours sa ship, and although I easily got used to the no-signal and forever-duyan mode because I was in good company, day 2 itinerary promised dry land. I wore my breezy daisy dress as we neared our first stop: Iloilo. We left our things na muna in our rooms. The plan was after Iloilo, we will ride another 2Go Supercat to Bacolod. And then from Bacolod nalang uli kami sasalubungin ng MV St. Michael going back to Manila. But before that!!! 2Go Travel bloggers in our uniformed tees--ready to explore Iloilo! Yey! One of our first stop-overs in Iloilo is for lunch in BBQ Park in General Luna St. They served chicken inasal, and sizzling kangkong for the vegetarian (yey!). May buko halo-halo pa for dessert, salap. :p We also met the owner of this restaurant, and learned na they are one of the originals! :) So cool to have our first meal in Iloilo here in BBQ Park, thank you! Part of our tour din is to visit old churches in Iloilo, which mom approved while I was texting her from time to time (reporter ako e, reporter sa magulang! Haha). The first stop is the interesting St. Anne Parish Church, otherwise known as a feminist church or the Molo Church. Heard that St. Anne Parish is also the "Sistine Chapel of the Philippines". Meanwhile, in between touring, we also visited the popular Biscocho Haus para makapag pasalubong shopping! Again, wala sana akong plans to buy bilang umalis narin ang parentals for states, but I can't help et! Weakness ko talaga ang sweets, and I love their butterscotch!!! Dapat pala dinamihan ko na ang bili! Meanwhile, right across St. Elizabeth is the Jaro Cathedral, which houses the Lady of Candles and Madonna and Child images, is located in Jaro, Iloilo City. Curious! Curious! This Madonna and Child image is believed to be miraculous and have grown from its original size. Senyora Candelaria, or the Lady of the Candles is the only female image in the all-male statues in the Jaro Cathedral. Outside the church, Pax bought yummy kakanin we ate while asa bus. Last stop in Iloilo was in the capitol, where we were able to send our help to the people affected in the city during Yolanda. Thank you 2Go Travel for giving us this opportunity to bring our donations and help in our own way. I love the view of Iloilo from the Capitol. 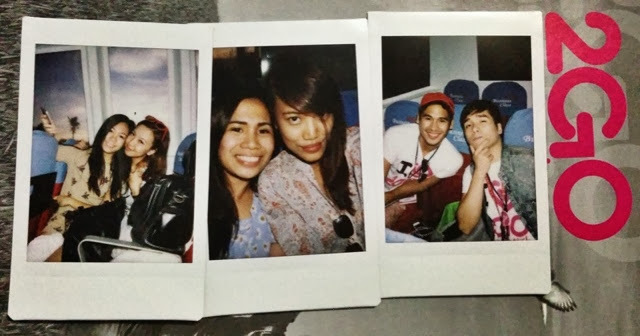 Our stay in Iloilo was bitin! According to our tour guide, Iloilo is also known as the "City of Firsts", with the first and oldest Protestant hospital in the country, first Baptist Church in the country, first colony established by the Spaniards, etc. To me, it was a meaningful first time in the City of Firsts, touring the churches and ending with a charity work to at least leave a small mark in this beautiful beautiful city. We then rode the 2GO Supercat for a less than 2-hour ride to our next destination: Bacolod. Tulog lang ako the whole time, but ramdam na ramdam ko na yung waves, bilang hapon na nun and mas malakas na daw talaga ang alon. :p Afraid! But mas antok ako so tinulog ko nalang. Gabi na when we reached The "City of Smiles", but after the Bonamine-worthy boat ride, what a relief to be welcomed by a mini Mascara Festival! Ang bongga ng 2Go for letting us experience this, thank you! Part of our Bacolod agenda is to visit the Lacson Mansion, or more sikat as The Ruins. This house was built in the 1900s by Don Mariano Ledesma Lacson, a sugar baron, for his deceased Portuguese wife Maria Braga. Thus, with almost the same story, the place was also known as the Taj Mahal of Negros. The Ruins is a very romantic place, especially at night. Isama pa ang story why the house was built! < 3 Hay... Maka balik nga sa St. Anne parish! Hehehe. According to our tour guide, The Ruins was made of grade A concrete and egg shells kaya daw smooth and matibay the structure. Not sure about the egg shells tidbit though, haha! Calea is in Lacson St, ground floor of Robinsons Place Bacolod. Nakakaoverwhelm the place! For a sweet tooth, nakakalito talaga what to order! We all had slices of cakes and a cup of coffee or tea or hot choco. We were about to leave na when Paul got the extra cake, as in scooped it with his bare hands na parang sandwich lang, lol.